Jessica Brumley, Vice President of Facilities Operations and Planning, joined the University in January 2018. She is responsible for developing and maximizing the value of University-owned and operated real estate, while providing strategic vision, leadership, coordination and administrative oversight to services that enhance the academic, clinical, and research experience of faculty, students, staff, patients, and the local community. Ms. Brumley is responsible for the following departments: Campus Planning, Design and Construction, Facilities & Operations, Parking and Transportation, Emergency Management, Real Estate, Environmental Health and Safety, Clinical Engineering/Compliance, Replacement & Renewal, and Space Management. She has contract administration responsibilities for a number of subcontracted University services. 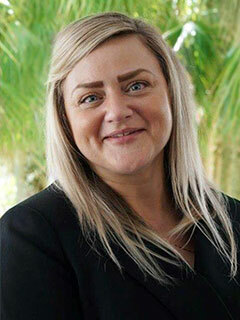 Ms. Brumley was formerly Vice President for Facilities Management at Nova Southeastern University, where she was responsible for a $140 million operations and capital budgets. She led efforts in delivering critical design, construction, acquisition, emergency management, environmental health and safety, security, and operational support to a 314-acre campus, as well as over 20 campuses, clinical locations, and administrative sites throughout South Florida and Puerto Rico. During her tenure at NSU, she developed more than 1.6 million square feet of classroom, clinical, office, and simulation spaces. She also implemented efficiencies in facilities management processes to improve service to the end user. Also at Nova Southeastern University, she served as Executive Director of Facilities Management, and Director of Design and Construction. Prior to this, she served in facilities and construction roles at both, Toyota and AutoNation. Ms. Brumley holds a Bachelor of Arts degree in Architecture from the University of Pittsburgh. She is a board member with March of Dimes and member of the Urban Land Institute. In 2015, Ms. Brumley was a South Florida Business Journal’s 40 under 40 award winner.